'There Are Places I Remember': December 1980 - The morning after in Liverpool. The fan's story. December 1980 - The morning after in Liverpool. The fan's story. I can remember the 17 August 1977 clearly, despite being only six years old at the time. It was the middle of the summer holidays. My Mum decided to take me and my three year old sister to see my Nan. We walked (well, my sister was in her pram) from our house, entered Court Hey Park from the entrance in our street and eventually came out the other side by my Nan's house, where my Mum had been born in 1944. and where she lived until she married my Dad in 1968. I'm sure we went to my Nan's lots of times. In fact I know we did. Mums didn't work in the seventies like most have to today, and mine couldn't drive so during the week she was probably limited to where she could take us without my Dad and the car. The reason I remember this visit to my Nan's over so many of the others is because this is the day the UK found out that Elvis Presley was dead. My Mum LOVED Elvis. To her last days, fighting Alzheimers Disease she still retained a memory of him and could tell you how she used to have a pillow on her bed with his face printed on it. She slept with Elvis every night. 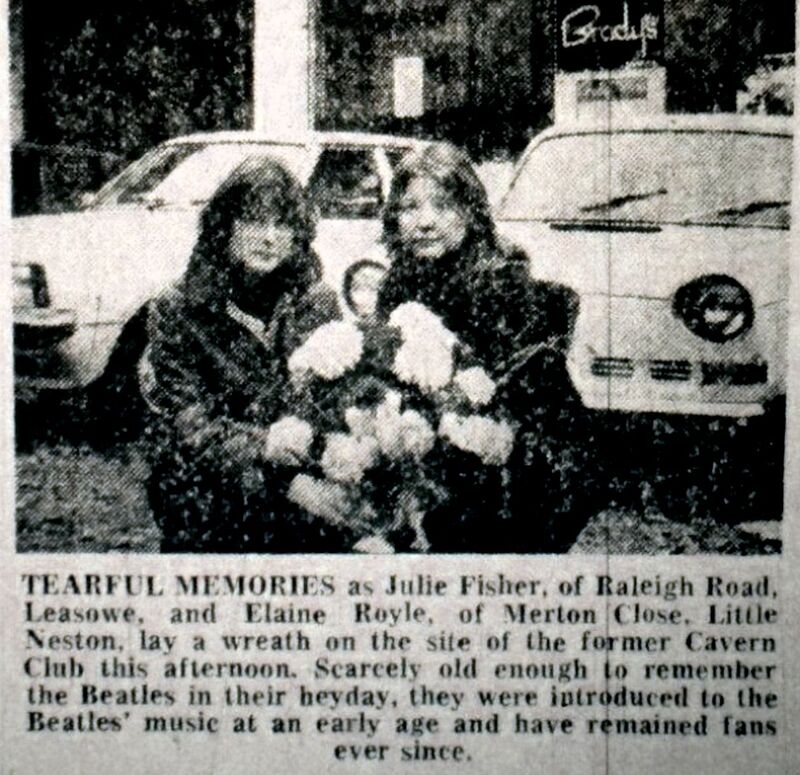 She may have been a lunchtime Cavern regular from when she started work in 1961 and enjoyed watching the Beatles but they were just local lads, roughly the same age as her. Elvis was a real star. So, you can imagine how she felt when she heard he was gone. She was only 33. 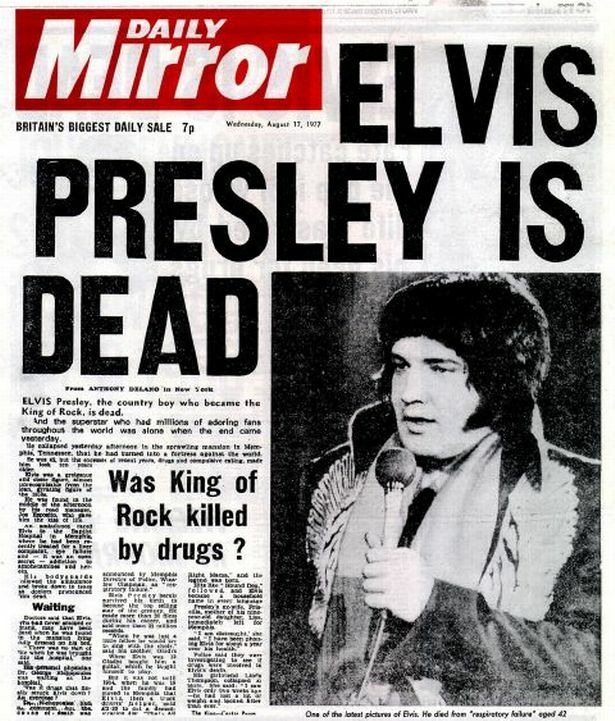 Mind you Elvis was only 42. 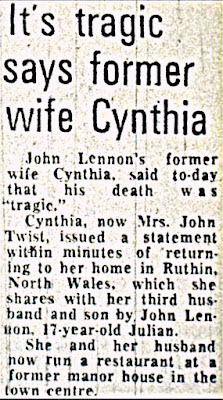 I can remember her looking at the headline on Nan's Daily Mirror (I don't recall us ever having a daily newspaper in our house other than the Echo) and talking through it with her Mum, who obviously would have appreciated how upsetting it was for her. Besides, Nan loved Elvis too. I recall 'Harbour Lights' being one of her favourites. I wonder if Mum had purposely chosen to visit Nan that day because Elvis had died? So, despite being six and having no real idea who Elvis Presley was, his was the first celebrity death I was aware of. 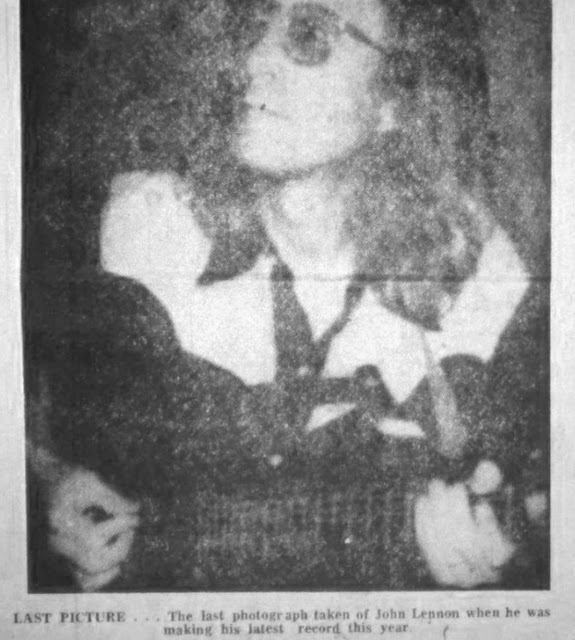 The second, unfortunately, was John Lennon. By then I was a month off 10 years old. On the afternoon of 9 December 1980 I saw the report on 'John Craven's Newsround'*, the BBC's after school children's news programme aimed at 6 to 12 year olds. 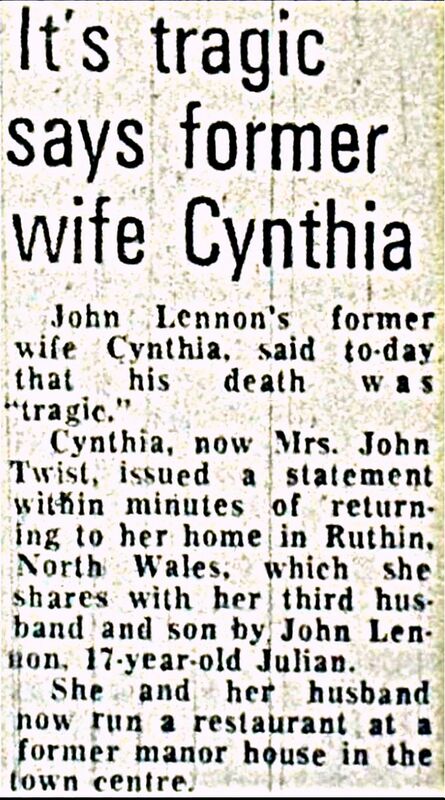 I can still see John Craven telling us that John Lennon, one of the Beatles from Liverpool, where I lived, had been shot dead. I've not been able to find the clip since but I swear the most vivid images I recall from that bulletin were those of distraught fans outside the Dakota. Absolutely distraught. Of course, there were many more bulletins and tributes throughout that night and probably the next, and those images could have come from any of them, and were probably constantly repeated but to this day I struggle watching them. I'm not great watching people beside themselves with grief. 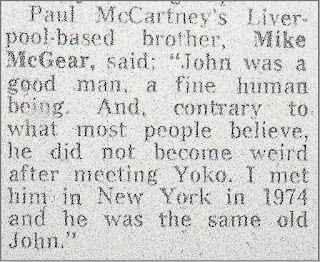 By 1980 I knew who the Beatles were, if not any of the minutiae that I revel in now. One of the greatest gifts my parents gave me was a quest for knowledge and exploration. We seemed to be off out somewhere every weekend visiting parks, Castles, Farms, Museums, stately homes.... and with my Dad's parents living in Hertfordshire there were regular trips and long drives down south during school holidays to visit them. Our journeys were accompanied by my Dad's tapes and two of our favourites were the Beatles' red and blue albums. Probably like many kids of the seventies they were my introduction to the group and as a result they are another of the greatest gifts my parents ever gave me. Not many things still give as much pleasure forty years on. My Mum and Dad were obviously upset. They'd both seen the Beatles at the Cavern. 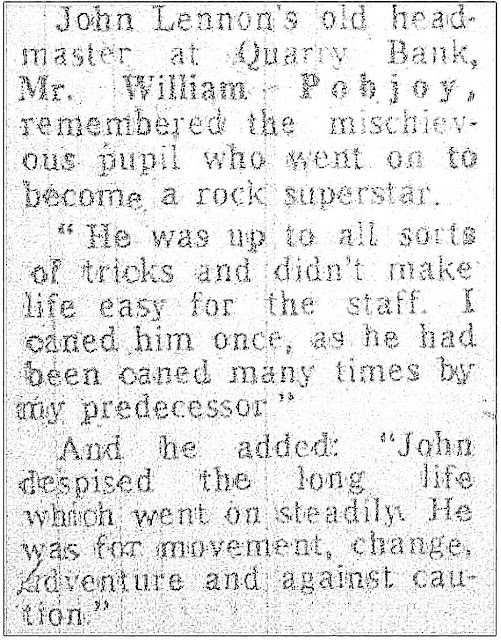 Dad had been in St Peter's Sunday School in Woolton when John Lennon and his best mate Pete Shotton were there but he was four years younger. We had a copy of John's current single, 'Just Like Starting Over' (still in my possession today) and I've wondered whether Mum bought that before John's death, or as a reaction to it. As I mentioned above, we never had any of the red top papers in our house. 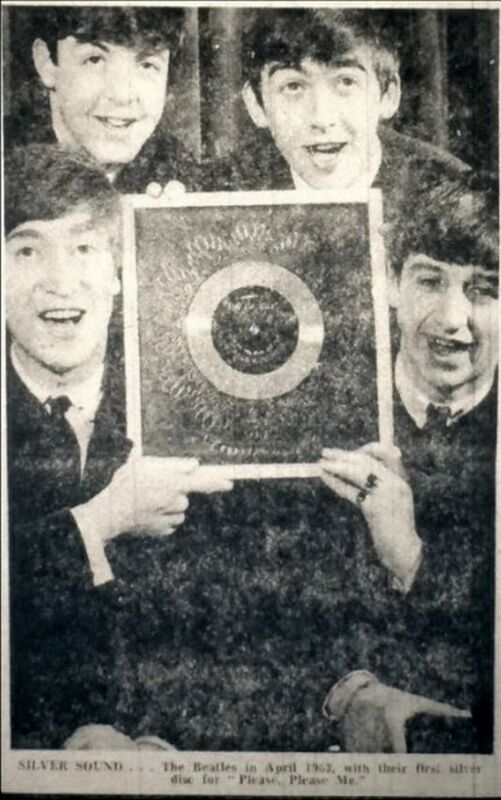 Dad bought the Liverpool Echo. I can imagine how they poured over it that night and the memories it must have brought back. Mum and Dad were only 36 then. 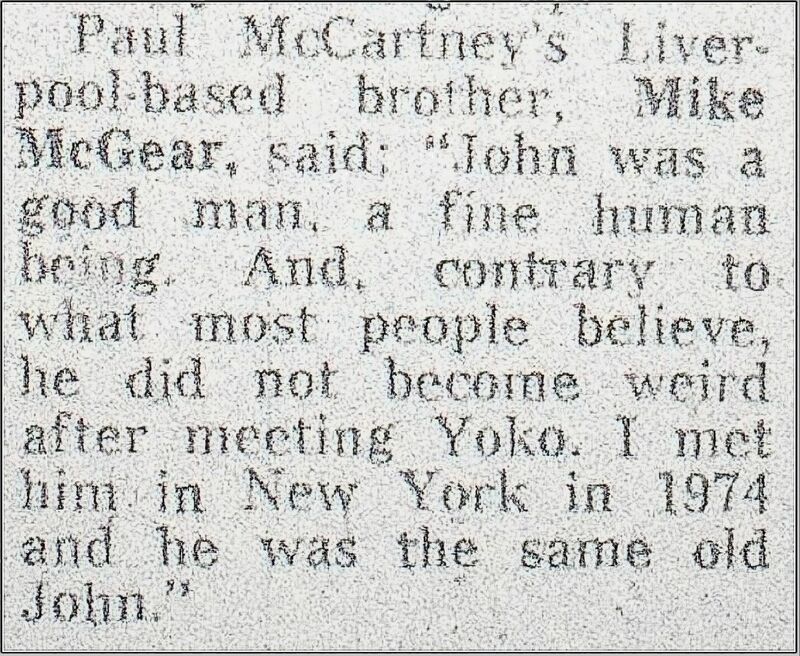 Mind you, John Lennon was only 40, seven years younger than I am now. This copy of the Echo has been on my my wall for many years... 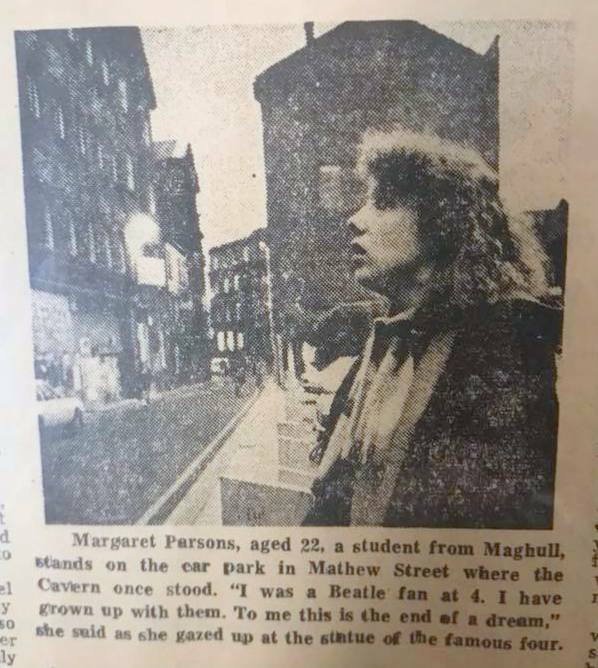 I have often wondered what became of the Beatles' fan and student immortalised on Mathew Street the day after that tragic event... her name was Margaret Parsons aged 22 on Dec 9th 1980.... are you out there? Never underestimate the power of social media because within hours Simon had his answer! Simon Harrison: Margaret it’s an honour,I’m so sorry to cause you any embarrassment , but you have adorned my wall for over 30 years now and I have often wondered if the photo was taken by chance? Were others taken? Was it a true reflection of your thoughts? It would be amazing to see you photographed in the same spot all these years later. Margaret Parsons: Simon Harrison (it made me laugh out loud) that I adorned your wall for all those years. I am flattered! No you have not caused me embarrassment. Looking back now I kinda feel honoured that that moment was captured ! I am 60 now. I don’t photograph as well now given (but back then) I had a curly perm and my dog tooth Sherlock Holmes type cape. 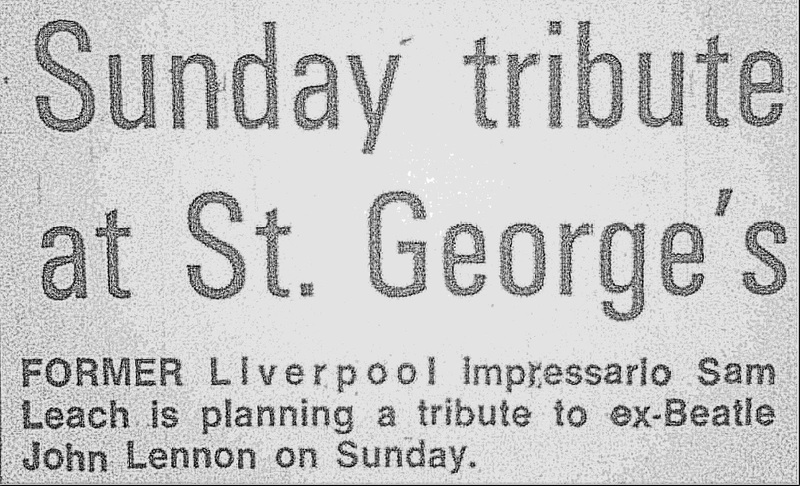 Margaret Parsons: As a big Beatles fan, my mum awoke me very early morning on that fateful day to tell me the sad news John Lennon had died. I was really upset and so I thought I would get up and go into Liverpool on the bus to Mathew St to the Old Cavern ( which was then just a car park as council had torn original down and they had yet to build the new Cavern and Cavern walks) and pay homage and my respects to John at the Beatles spiritual home. I went there thinking there would be lots of other Beatles fans also doing the same. I arrived at 8am and was so surprised to find no other Beatles fans in sight on Mathew st. I was on my own apart from the occasional person walking through the street to work. 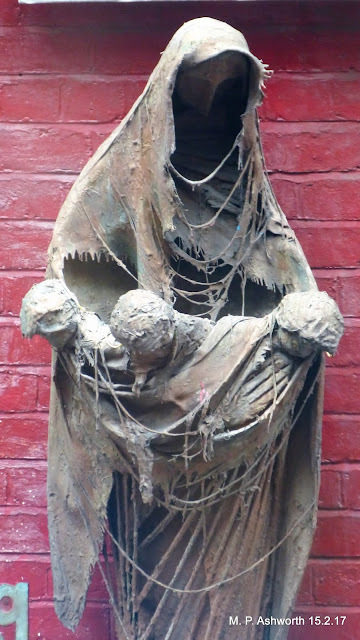 As I gazed up at the wall at the Madonna statue holding the Fab Four in her arms a guy appeared from nowhere (man) and asked if he could take my photo! He took my details and a quote - by the way my 'end of a dream' quote was in reference to the fact that there would now never be the possibility of the Beatles reuniting. The photographer told me he was from the Liverpool Echo newspaper, which I tried not to believe as I had told my Mum a fib that I was going into town shopping as when I had first said I was going in to the cavern she thought I was daft! When I got home later I never said a word to my Mum about the Echo and photo. At tea time I offered to go and collect their Echo newspaper from the shop thinking that photographer guy must have been having me on! 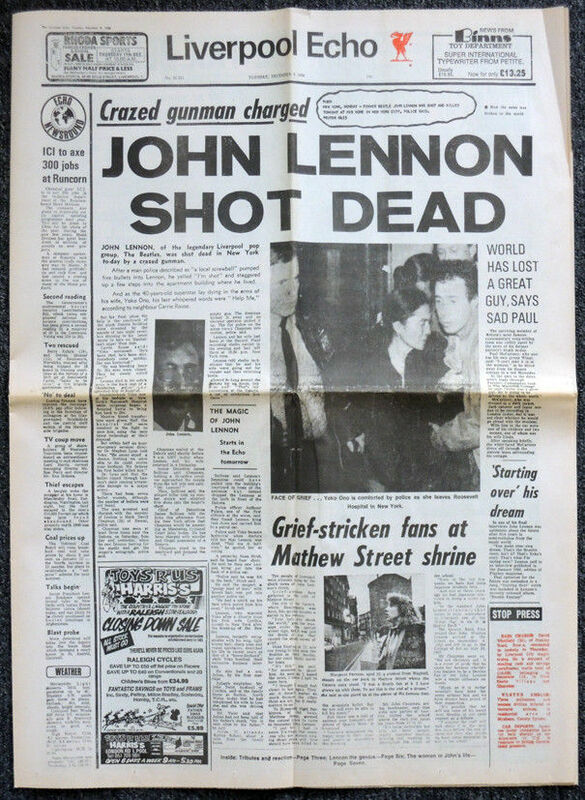 The Echo was foolscap (sold folded in half) and not tabloid in those days so when I got out of the shop all I could see was the headlines of Johns death. But as I opened up the front page I was mortified to see that in the lower portion below the crease was my photo and my quote. I was in a sweat having fibbed to my Mum where I had been. My sins had found me out! When I got home to I said to Mum 'I have something to tell you' as I gave her the Echo... she just smiled. 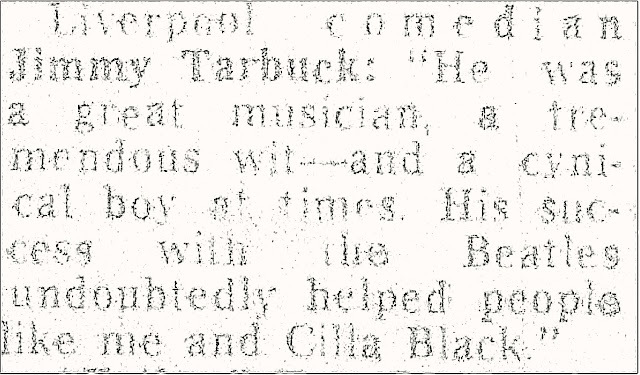 Here's some extracts from that night's Echo. If Julie Fisher or Elaine Royale see this and would like to share THEIR stories please get in touch! 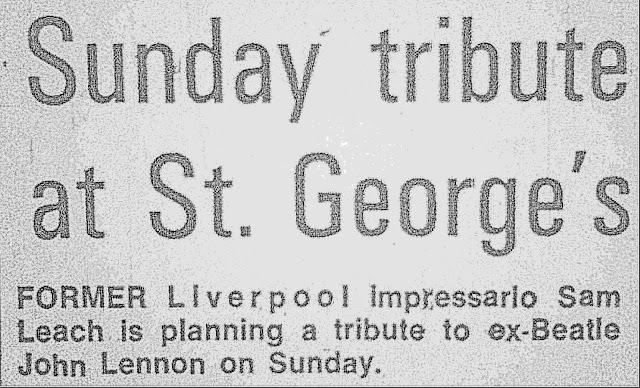 On 30 November 2001 I was in Manchester heading towards my office when I caught sight of the newspaper headline: Beatle George is Dead. I bought the paper, took a deep breath and tried to digest the news at my desk. The event drew scant attention from my Mancunian colleagues. Whatever I was feeling I managed to bottle up until I returned to Liverpool in time for tea, switched on the evening news and cried uncontrollably for two hours. Thanks to Simon Harrison and Margaret Parsons. * John Craven's newsround (now 'Newsround') has run continuously since 4 April 1972. It was one of the world's first television news magazines aimed specifically at children. Newsround was the first British television programme to break the news of the loss of the Space Shuttle Challenger on 28 January 1986. The programme was also first in Britain to report an assassination attempt on Pope John Paul II in Vatican City in 1981 and provided the first reports from the Windsor Castle fire of November 1992.